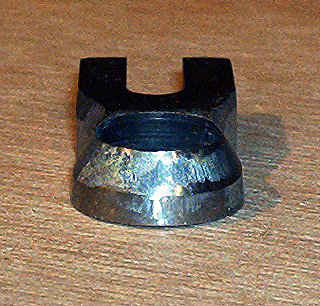 Using the Hamlet Siragas hollowing tool (I have the “Big Brother” version) with the standard grind can give a tendency for the cutter to become clogged and there can also be a tendency for the tool to “chatter”, especially when the cutter is well extended over the toolrest. What follows are my suggestions and observations which, in my opinion, make the tool far more useable but feel free to ignore me and do your own thing ! If, however, you do take my advice, the worst that can happen is that you end up ruining the cutter but as these can be replaced, its not the end of the world ! 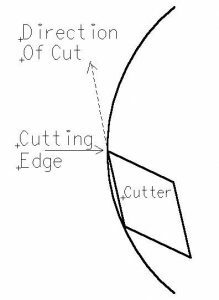 In my opinion, part of the problem is the length of the “bevel” on the outside of the cutter – with relatively small diameter openings, the angle that the cutting edge is presented is too high. This is because the base of the bevel effectively holds the edge at an angle to the workpiece, rather than the optimum situation where the bevel is parallel to the workpiece. The cutting edge is trying to cut deeper into the wood and all that is preventing it from doing so is the cutter guard. The result is that the cutter is “pulled” back out, tearing the wood fibres rather than cutting them and the piece of wood that is torn out, jams between the cutter and the guard. The diagram below will explain what I mean. The diagram shows a cross section of the cutter edge presented to the workpiece. For clarity, the cutter guard has been omitted. The base of the bevel is the point where the bottom of the cutter contacts the workpiece so the course of action necessary to reduce the angle between the cutter and the workpiece is to shorten the bevel by removing the bottom corner. As the bevel becomes shorter, the angle between the cutter and the workpiece reduces. The “ideal” situation, where the angle between the two is zero, would be a bevel of zero length but this just wouldn’t be practical so a compromise has to be made. 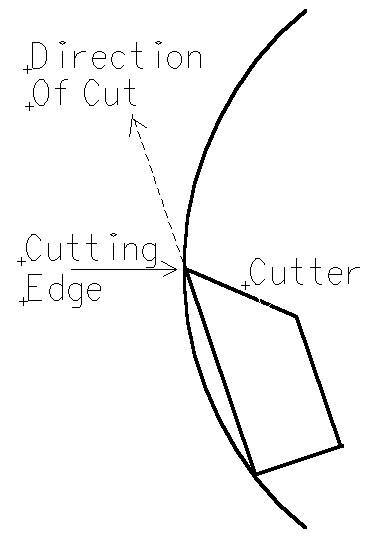 The diagram below shows how the modified cutter reduces the cutting angle. To regrind the cutter, I used a grinding table that could be adjusted to the appropriate angle (I used 28 degrees) for the cutter and ground the corner away to produce the second bevel. This was ground back to the point where the bevel reached the bottom of the hole in the cutter which produced a second cutting edge on the bottom of the tool. One word of caution, take things slowly when you grind because its easy to take of a little more but not so easy to put some back on ! Also, taking things slowly will reduce the heat build up. 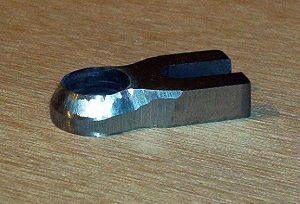 Now the cutter looks more like that on a standard ring tool and as a secondary benefit, can be used as one too ! The cutter can be mounted “upside down” without the guard on the shaft and used for hollowing as a conventional ring tool would be used but with the added benefit that the cutter can be angled to give a better result. Using the tool like this allows rapid removal of material. So now you have two cutting edges that can be used instead of one ! Another bonus of this modification is that honing either of the two cutting edges becomes a little easier and quicker because the shorter bevel means less metal to remove. 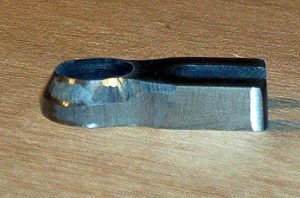 Below are a few photos of my cutter (shown upside down) after regrinding (and a little use and honing). With the modified grind, the cutter works much more efficiently, is less prone to clogging and chattering and can be used the other way round without the guard so you get the best of both worlds ! If anyone else has tried this, or has any comments or suggestions, feel free to email me, It’s always nice to get some feedback. So far those who have contacted me seem to agree with my findings.